Play Spider-Man / X-Men: Arcades Revenge Now! This is truly one one the most fun games I've played, in terms of pure action. Five different characters, each contributing his own part to the story, and each with unique game-play, make this an especially interesting and challenging experience.Start out as Spiderman, on a mission to rescue the missing X-men from a suspicious trap. Spiderman must break into Arcade's lair by disabling the security system. But the fun is just beginning, because Arcade has something special in store for each of our heroes. Spiderman must now use his web-slinging and wall-crawling skills to navigate a creepy construction site, rigged up with exploding concrete and grenade-lobbing robots.Wolverine gets dropped into a circus gone mad. Luckily he has regenerative power (when not using his claws), cuz he's gonna need it. Slash your way through crazy clowns, Tommy-gun toting Jack-in-the-boxes, and a host of angry toy soldiers.Cyclops is going to wish he could see the light of day. Arcade sends him underground, where in addition to Genoshian guards there are Subterraneans who are immune to his Energy Beam! Also be careful of the trolley tracks, their high voltage spells instant death if you miss your ride.Storm has also lost a major advantage: to neutralize her flying ability, Arcade has locked her in a water-filled dam! Swim through, busting all the generators along the way to free her. Her air supply is the real limitation here, so watch it carefully and try to keep some air spaces free as you move.Gambit's challenge is a world of robotic Chess men. Use explosive playing cards to blast your way through enemies and obstacles, and catch 100 Stars to earn an extra life. But wait, there's more! If you don't keep moving fast enough, the Doom Ball will roll right over you! Grab the blue circles to push it back a bit. In a sticky situation, your Jokers will take out all enemies in a close range around you, but you can only carry two. There are two levels for each hero, but the basics are about the same, with the following exceptions. In Wolverine's second mission, Juggernaut is constantly on your tail. If you rush, he just speeds up, so keep turning and attacking but don't let him touch you. Drop anvils on him for extra damage. If you don't beat him by the end of the level you'll be stuck between him and a bottomless pit. On Gambit's second mission, you scroll upward instead of right, but you must still keep moving because the floor will rise to crush you against the obstacles in your way. You can beat the missions in any order, but you must beat both missions for each hero to move on to the final confrontation. 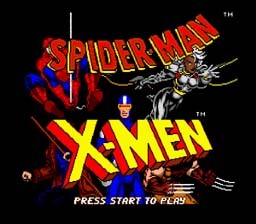 Then after another mini-level for each of the X-men, Spiderman ultimately takes on Arcade himself. In Gambit's first quest, about half-way through the level, you will come to a point where the orange blocks reach up almost to the top of the screen, just after a high bridge guarded by Knights (see screen shot 3). If you get on top of the block and keep jumping up beyond the screen, you will find an infinite supply of stars! If you get here far enough ahead of the Doom Ball, you can collect dozens of extra lives.